What does it mean to open ourselves to WONDER? WONDER. What emotion does that word elicit in you? Artist Gabriel Dawe Made a Rainbow Out of 60 Miles of Thread. The Renwick Gallery Grand Staircase and Leo Villareal's 23,000 Points of Light : it uses LEDs embedded in 320 mirrored stainless steel rods. 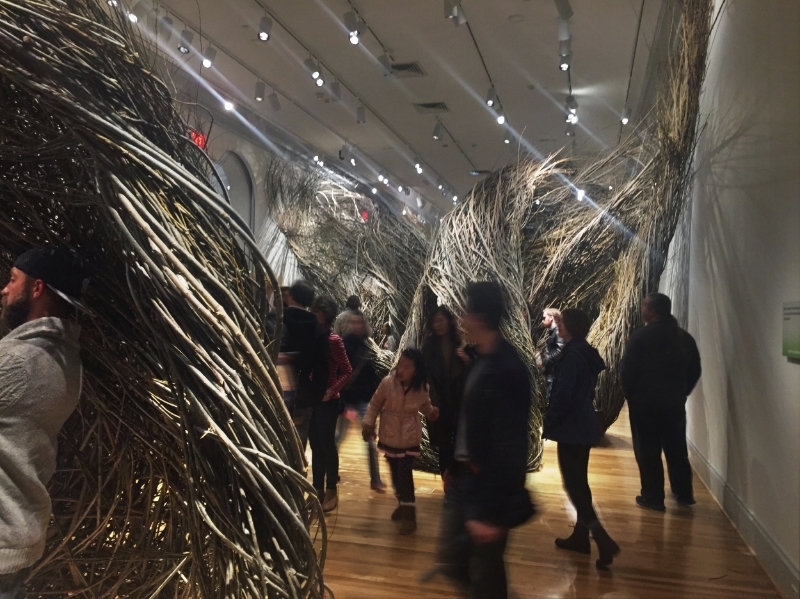 The Renwick building, a National Historic Landmark, has just reopened after a 2 year $30 million dollar renovation featuring a larger than life exhibit titled: WONDER. The Renwick Gallery is the first building in the United States built expressly as an art museum, and is considered one of the first and finest examples of Second Empire architecture in America- its designer and architect, James Renwick, traveled to France to be inspired by the Louvre. 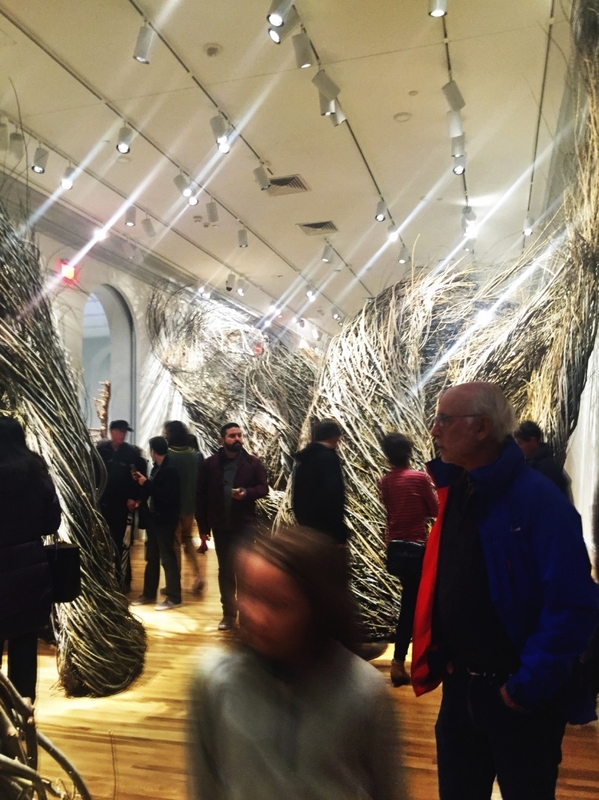 Visiting the Renwick Gallery's Grand RE-Opening and pondering WONDER? Tara Donovan stacks a million index cards in a crazed accumulation experiment that looks much like the Canyonlands National Park in Utah. Jennifer Angus uses thousands of insects, beetles, bugs, parasites and flying larvae to resemble patterned wall paper in the beautiful Second Empire styled Renwick. Wonder what you’ll see? 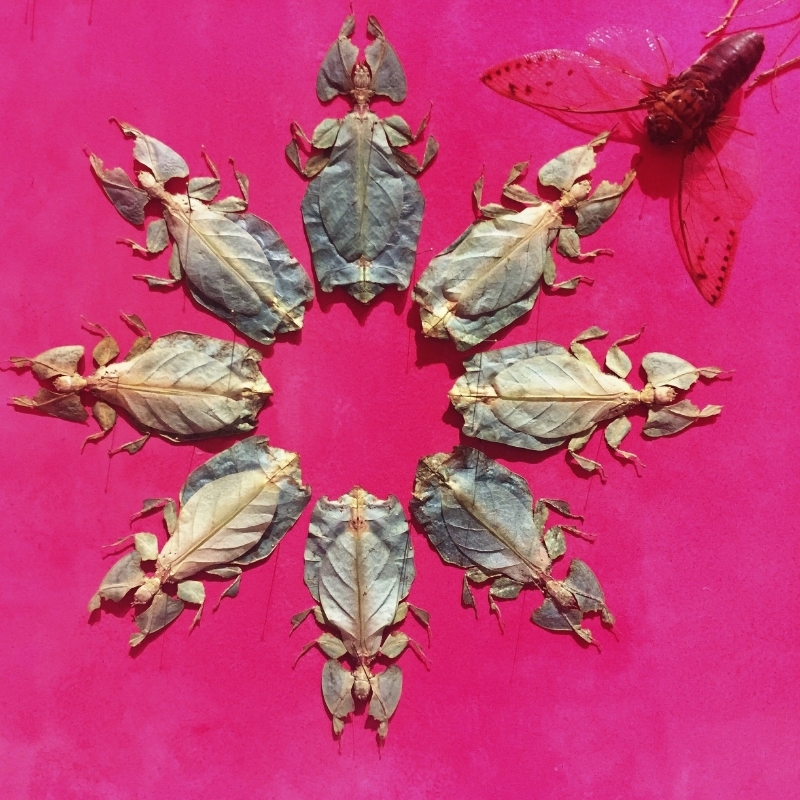 Here’s a sneak peek: Jennifer Angus covers gallery walls in spiraling, geometric designs reminiscent of wallpaper or textiles—but made using specimens of different species of shimmering, brightly-colored insects. Chakaia Booker splices and weaves discarded rubber tires into an enormous, complex labyrinth as Gabriel Dawe hangs thousands of strands of polyester sewing thread to create what appear to be waves of color and light sweeping from floor to ceiling. 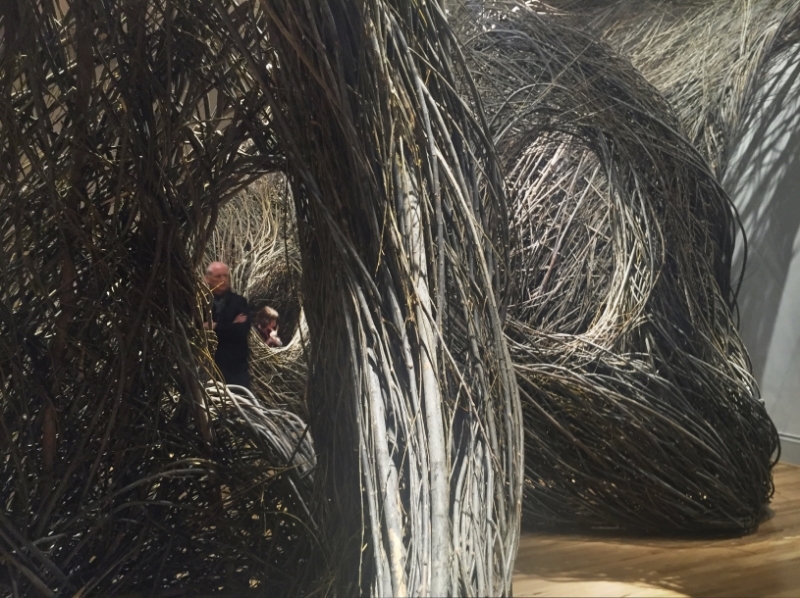 Patrick Dougherty weaves monumental structures from countless tree saplings while Tara Donovan constructs looming spires from hundreds of thousands of individually-stacked index cards. 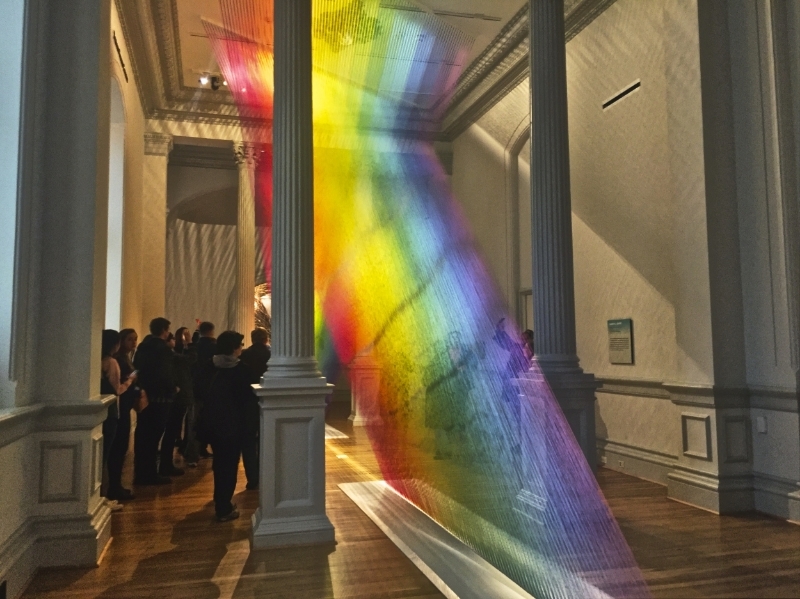 JanetEchelman explores volumetric form without solid mass, overtaking the museum’s famed Grand Salon with a suspended, hand-woven net surging across its hundred foot length. Using 500,000 pieces of reclaimed, old-growth cedar, John Grade builds an intricate structure based on plaster casts taken of a massive, old-growth hemlock tree in the Cascade Mountains. Maya Lin’s deluge of green marbles flows across the floor and up walls, recalling the tides of the Chesapeake Bay, while 23,000 LEDs—programmed by Leo Villareal to display a code manipulated into endless variations—flash above the Grand Staircase. Using 500,000 pieces of reclaimed, old-growth cedar, John Grade builds an intricate structure based on plaster casts taken of a massive, old-growth hemlock tree in the Cascade Mountains. In WONDER, nine leading contemporary artists are each taking over different galleries in the Renwick Gallery building, creating site-specific installations inspired by the spaces and transforming the entire museum into an immersive artwork. The Gallery is taking a different approach, and actually encouraging people to take photographs and share their visits using #RENWICKGALLERY. 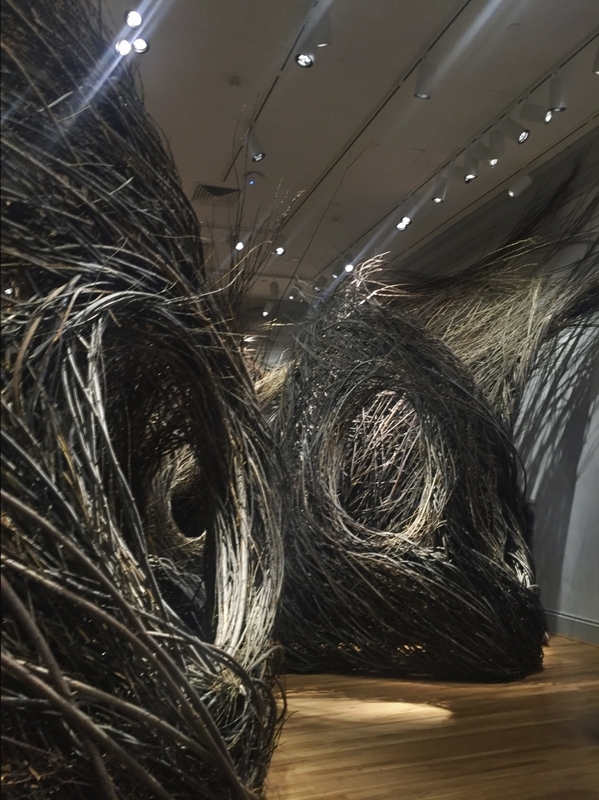 Check out the instagram feed #renwickgallery for more inspiration. Folding the Chesapeake by Maya Lin in the newly re-opened Renwick Gallery. The new chandelier at the freshly renovated Renwick Gallery. The shimmer is a randomized program of streaming ones and zeros, each wave never really the same as the next. Dazzling. Photography Encouraged: What does it mean to open ourselves to WONDER? The Renwick Gallery Grand Staircase, featuring Leo Villareal's fascinating ever changing chandelier.